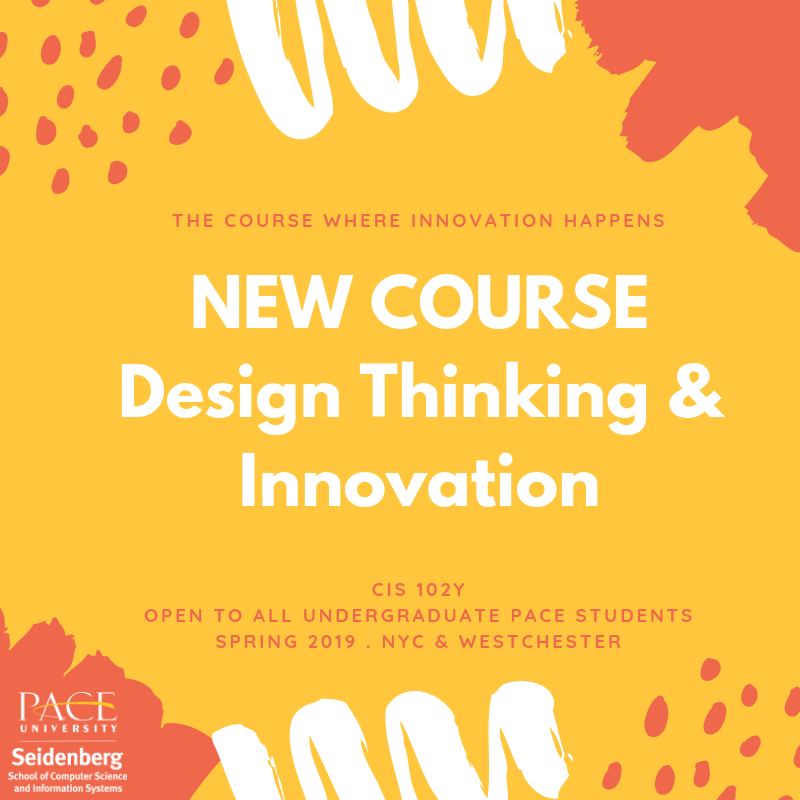 A new course is coming to Pace University’s Seidenberg School of Computer Science and Information Systems for students who want to be in the room where design and innovation happen. This project-based learning course introduces students to innovation and problem solving using the design-thinking framework. The course emphasizes complex problem solving, critical thinking, creativity, communication and teamwork. The course is a corner stone experience for students in their first or second year at Pace University and is open to all undergraduate majors. Testing prototypes with the user for feedback. Students apply the knowledge acquired through these exercises to a team-based project. Projects are based on problems posed by industry clients. Industry clients may include not-for-profit or for-profit organizations. Project deliverables include a mid and end of semester presentation, an electronic or physical product prototype, and written project reflection reports. Through this course students will learn about project-based experiences, in particular those offered through the NYC Design Factory. The NYC Design Factory is a hub for innovation and creative problem solving housed within the Seidenberg School of Computer Science and Information Systems at Pace University. The NYC Design Factory welcomes students of all majors. The most popular courses include Product Development Project (PDP), Product Innovation Project (PIP), and Challenge Based Innovation (CBI). As part of these courses, students travel to Helsinki (Finland), Graz (Austria) and Geneva (Switzerland) to develop solutions for challenges posed by industry clients. These courses link technology, production, and marketing Check out the NYC Design Factory website to learn more about our offerings. Are you looking for an exciting course to register for in Spring ’19? Look no further – register for CIS 102Y Design Thinking and Innovation today!